It took just $4,200 for al-Qaida of the Arabian Peninsula [AQAP] to launch its latest attempted attack, "Operation Hemorrhage," the bombing of Western targets and cargo planes with mail bombs, according to a special edition of the group's English language Inspire magazine released over the weekend. Although many analysts have cited the magazine's depth of detail surrounding the attempt, a number of surprising omissions also provide information about the evolving plots of al-Qaida. Notably, the special edition's articles go into great depth about strategic and technical aspects of the effort, and how this is the beginning of an era of small, low investment attacks. However, the whole magazine is missing any sort of clear message from Anwar al-Awlaki, the U.S.-born Imam who was quoted heavily in the first two editions. The "Letter From the Editor" notes that AQAP's strategy has shifted dramatically from its so-called "blessed operations of Washington and New York" on 9/11, a large-scale attack that took tremendous planning and coordination from al-Qaeda leaders. The editorial declares that the mail bombings plot is part of the new shift towards dozens of small-scale attacks, a trend that counterterrorism officials had already begun to notice. The magazine's formal statement about the attack further emphasizes AQAP's evolving "strategy of a thousand cuts," which aims to damage American interests abroad and "bleed the enemy to death." It also says the assaults are designed to undermine American confidence and security by circumventing the complex security methods developed in the wake of 9/11 and other al-Qaida attempts on American planes and airspace. The magazine spells out that the attempted strike represents AQAP's attempt to link its regional cause, fighting the Saudi and Yemeni governments, with some of the greater aims of the global jihadist movement. For example, an article entitled "The Objective of Operation Hemorrhage" attempts to capitalize on the globally popular Palestinian cause and also declares the al-Qaida mail bombs as the response to the "long history of aggression by the West against the Muslim World." Notably, the Palestinian question is a source of frustration which al-Qaida has only symbolically addressed up to this point. On the other hand, the article "Tawaghit [tyrants] Exposed" shows that the attempt was also meant to "reveal" the collaboration of local governments with the West and Jews. In the piece, AQAP declared that the operation "comes to expose the traitor Arab rulers who are competing in pleasing their American masters" and condemns the Saudi monarchy "for proving their love for the Jews." It also warns Muslims not to wait "for these traitor governments to free Jerusalem or to stand in the face of the Crusader invasion on Muslim land," for "they are stooges to the Jews and Christians." AQAP's declarations about fighting the West simultaneously while exposing the Saudi government, fit in line with al-Qaida's global strategy of striking the far-enemy, America and the Jews, who empower the near-enemy of the regional governments. This strategy is also clearly visible in the choice of targets by the plotters. According to the magazine, the addresses on the packages were two synagogues in Chicago, President Obama's hometown. In addition, the synagogues were specifically selected targets, the representatives of al-Qaida's war against Western liberalism and Zionism. Congregation Or Chadash is home to a gay/lesbian community, while Congregation B'nai Zion was erroneously linked to the political movement of Zionism. The symbolism didn't stop there. In the article "The Objectives of Operation Hemorrhage" AQAP attempted to 'put its attack in perspective' by naming two historical figures as recipients, Reynald de Chatillon and Don Diego Diaz. De Chatillon was a Crusader leader who was killed by Muslim liberators, while Diaz was a figure in the Inquisition's expulsion of Muslims from Spain. Thus, the bombing would avenge historic wrongs and be a message of striking the modern day Crusaders and Church. The magazine also pointedly declared several other messages to the U.S. government. The article "Technical Details" reveals that AQAP has become familiar with weaknesses in Western security methods in inspecting packages. It sealed the devices to avoid bomb-sniffing dogs, used the explosive PETN to avoid metal detection equipment, and sidestepped X-ray machines through methods discussed in an earlier edition of its Arabic publication, Sada' al-Malahem. In addition, the magazine taunted US counterterrorism officials by asking, "Isn't it funny that America thinks AQAP has only one major bomb maker?" The reference was to Ibrahim al-Asiri, AQAP's noted explosives expert whose was believed responsible for the plot. The article "Technical Details" further threatens, "Do you think that our research will only be used by al-Qaida of the Arabian Peninsula and won't be shared with other mujahidin?" In addition, the article "$4,200" notes that strategists of AQAP "do not mind at all in this stage if they [mail bombs] are intercepted." For AQAP, it's a "good bargain" to send cheap and relatively easily constructed packages, in place of putting "a mujahid on board a plane." However, even the abundance of detail doesn't hide some important missing pieces of the puzzle. AQAP and other al-Qaida branches constantly promote the glorious nature of martyrdom, while the most recent episode stresses using remotely controlled weapons that don't endanger its fighters. With a membership estimated at between 50 and 300, the organization may be increasingly conservative of its losses while expanding its range and types of strikes. 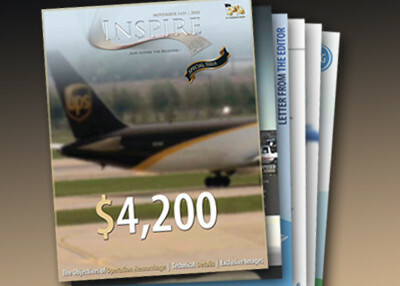 In addition, the two previous issues of Inspire quoted heavily from Awlaki, while the special issue never mentions his name. However, there are numerous fingerprints of the AQAP leader in the publication and attack, which may make it unnecessary to mention him by name. Awlaki read several classic novels in English during his 18 months in a Yemeni prison, from Aug. 31, 2006. According to a blog post that he authored after his time in prison, Awlaki was fascinated by Charles Dickens and read five of his novels. In the post, he drew parallels between Dickens' characters and examples relevant to his own experiences. A copy of Great Expectations, one of the books that Awlaki's parents delivered to him to read, was included in one of the bombs. It took a person knowledgeable in Western literature and with access to a copy of the English book to draw the parallel between the book and AQAP's optimism about the attack. Other signs of Awlaki's involvement include a little-noticed comment in the section, "Hear the World," and the choices of those listed in the "Free the Muslim Prisoners" section. In "Hear the World," a series of excerpts from Western news sources, the magazine quotes Rep. Peter King, R-N.Y., discussing the prevalence of homegrown jihadists using Awlaki's website. The magazine notes, "This did expose a weakness in our armor," a comment in line with Awlaki's public movement away from email contact with terrorist plotters. Awlaki recently gave free reign to any attempt, stating, "do not consult anyone with regarding the killing of Americans, the fighting of Satan does not require any fatwa, it does not require any consultation." In addition, "Free the Muslims Prisoners" also declares its support for freeing a number of small-time prisoners connected to Awlaki plots, while ignoring bigger names. Big name al-Qaeda-linked terrorists like Ahmed Ghailani, El Sayyid Nosair and Richard Reid are missing, while small time attempted terrorists and supporters like Paul Rockwood, Jr., Walter Bujol, Carlos Almonte, and 'Irhabi 007' (Younis Tsouli) make the list. Noticeably, the list reads like a who's-who of Awlaki followers, with only a few major terrorists added.